When people think of the Fourth of July, a grill usually comes to mind. But for me, it’s really about flag-themed manktops, sparklers, day drinking, and other forms of patriotism. 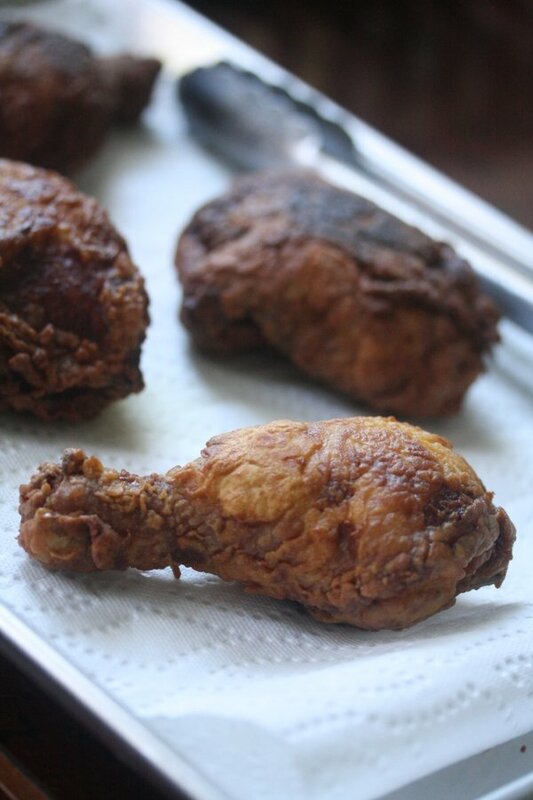 Though I’ve never dared break out the deep fryer while day drinking is involved, I don’t think there’s anything more all-American than fried chicken. 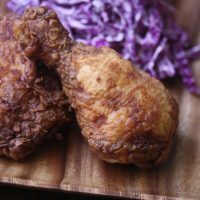 Last month, the folks over at Plated asked me to develop a fried chicken recipe for their Independence Day menu offerings. It was a tall order. They try to keep their dishes under 30 minutes, and assume that the average home cook does not have very many pots, pans, or gadgets at their disposal. Fried chicken is truly a labor of Southern love. The more time you have, the better your chicken will be. If you have lard on hand, even better. Just watch Octavia Spencer in The Help and take notes. But to accommodate the Plated cook, I tried to pack as much punch as possible into every step of the process, just in case they didn’t want to take 48 hours to let each marinate take hold. I also made the chicken in a skillet. While I was testing the recipe, I made half a batch using regular flour and half using AP gluten-free flour so that I could a) taste the result for seasoning and b) see if the frying varied for the GF flours. The result was not identical, but it was equally delicious. The GF version browned much faster than the regular, which meant flipping the chicken earlier, and turning the heat down slightly on the second side so that the chicken would have enough time to cook through without burning. I am embarrassed to say that I don’t own a candy thermometer, so I always do my frying by feel. 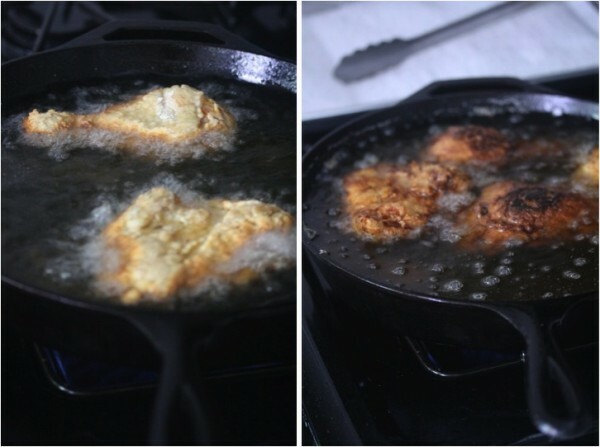 Definitely pay attention to what’s happening in the skillet and adjust the heat if your chicken begins to turn from that nice deep fry brown to black. You can see what happened to the tops of some of my pieces below – they weren’t burnt, but a little south of perfect. If you have non-glutards at your table, you can dredge for them accordingly. Just fry the GF batch first so there’s no cross-contamination. If you want to cut some corners this week, you can also order this dish from Plated in the next few hours. What are you all making for your July 4th feast? Let me know in the comments! 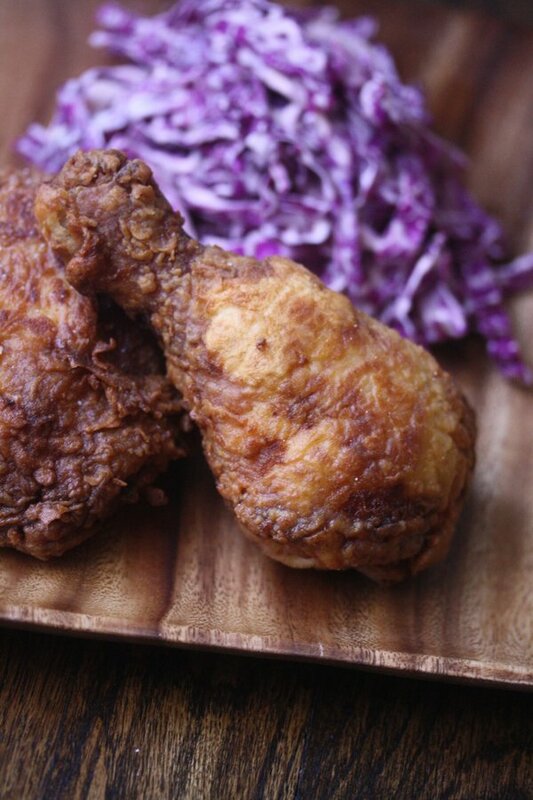 Classic fried chicken is a labor of southern love. The more time you have to let it hang out in the marinades, the better. But for the busy home cook, I’ve tried to add as much punch to each step of the recipes, with plenty of spices in the rub and hot sauce in the buttermilk bath. The chicken really benefits from overnight marinating. If you have time to start the night before, do so with the spice rub. Then add the buttermilk in the morning and allow to sit until ready to cook. In a medium-mixing bowl, whisk together 2 teaspoons salt, thyme, paprika, onion and garlic powder, and cayenne. Add the chicken and rub it allover with the spice mix. Cover, and marinate until ready to fry – for as long as possible, preferably, overnight in the fridge. Pour the hot sauce and buttermilk over the chicken. Slosh it around until well-coated. Marinate until ready to fry, up to 12 hours covered in the fridge. Place the flour in a shallow bowl. 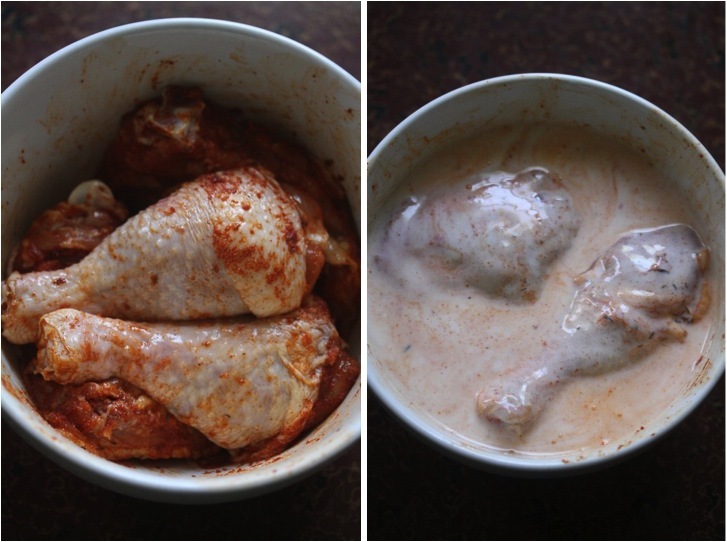 Remove the chicken from the buttermilk, shaking off any excess liquid. 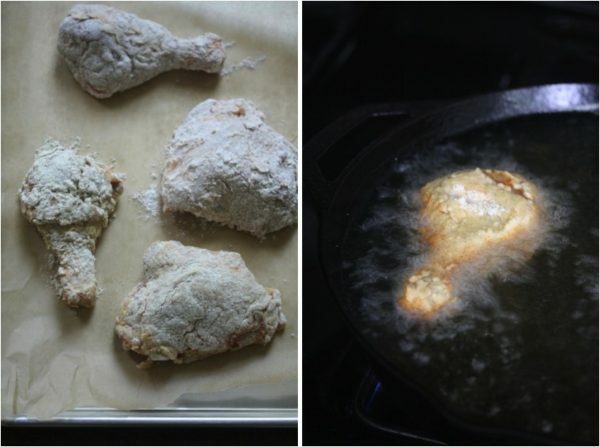 Coat chicken pieces in the flour, shaking off any excess. Cook the chicken in an even layer in the oil until golden brown, turning once, at least 12 minutes total. Adjust the heat if the chicken turns brown to the point of burning. Remove chicken to a paper towel-lined plate or wire rack to drain and cool for at least ten minutes. 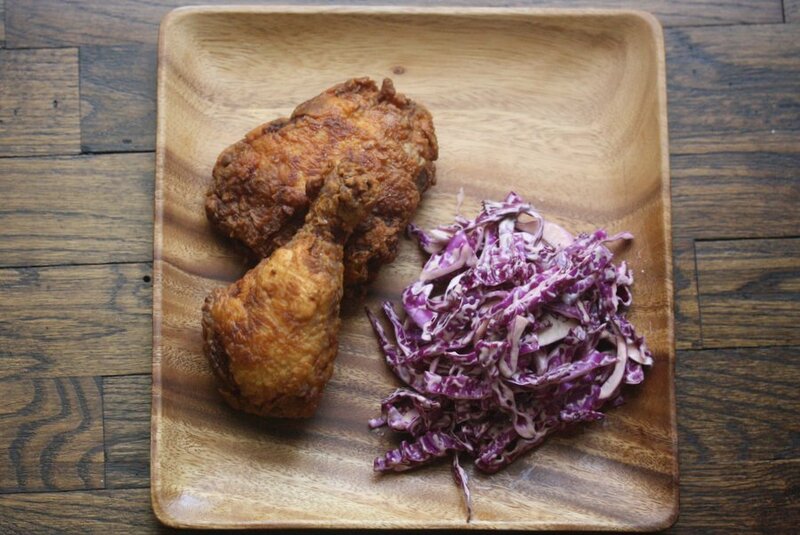 Serve the chicken alongside slaw, with some extra hot sauce for dipping. Frying for me is always about feel and I usually end up with darker pieces as I go along anyway. I am so happy you experimented with GF flour for this. I have been curious about trying it for a while. It looks delicious. Your fried chicken looks killer, Phoebe! And I’m so impressed with how quick and easy you made it too! Thank you Marie!! It’s always better to let it sit overnight at some point, but not too much harm done shaving time off – I tested it the short way and it was still delicious! Sorry for the really basic question, but I am just now learning to cook other things than scrambled eggs: how many pieces of chicken total is this for? Many thanks in advance! Hi Luis – good for you for picking up a spatula and getting in the kitchen! The recipe produces two thigh pieces and two drumbsticks. My general rule of thumb is 1/2 pound of protein per person. But if you’re using meat with the bone-in, you should up that number slightly. I say two pieces per person here, but if you’re big eaters, you might want to add an extra leg. The marinade and rub should stretch, but you might need some extra flour for dredging and oil for frying. Hope this helps, and thanks for stopping by! I just found this recipe today while I was perusing your blog. I am 20 months gluten free. 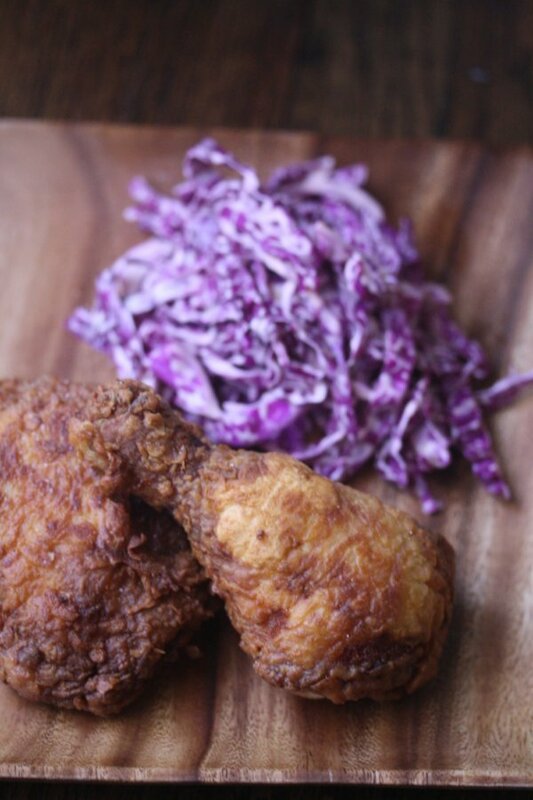 Last night I did a fried chicken for my husband using the same gf ap flour and the same spices as this recipe – only difference is I didn’t use the buttermilk. I dredged my chicken breast pieces in plain greek yogurt first then the spice/flour mix. Wow, all I can say is it is good, and very tender. Pan fried in coconut oil. Yes, you do need to watch to see that they do not turn too brown on the first side, and adjust the temp down to accommodate so they cook thoroughly through. I had no slaw, but I served with curried mashed sweet potatoes and green beans. What brand of AP GF flour would you recommend for this recipe? bob’s red mill is great, or cup4cup. it doesn’t matter a ton. Even white rice flour would work! My doctor put me on a gluten free and dairy free diet. Any suggestions for buttermilk substitute?